Alan, the owner of Perfectly Clean LLC, had us create a simple website for their cleaning service in the Fort Collins area. Previously, we completed the logo design for him and now the website is done. The website is a simple site with four pages, a contact form, and mobile device compatibility. The website is at perfectlycleanllc.com. 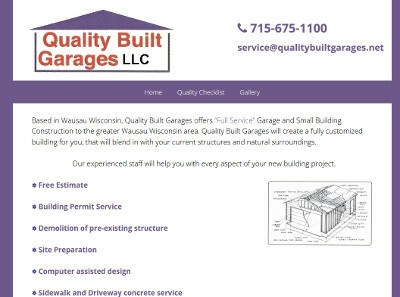 Jess, the owner of Quality Built Garages of Wausau WI, contacted us last week. He had a website but unfortunately lost it when the domain name expired and was not able to retrieve the domain name or the website. Therefore, he asked us for guidance on what to do. Because the domain name was already purchased by someone else, we opted to get the “.net” version of the domain name to keep the name as close as possible. Jess then sent us information to put together a very simple website that qualified for our basic website service. We had the website completed within 24 hours and the site is now live! Quality Built Garages website is at qualitybuiltgarages.net. Alan, the owner of Perfectly Clean LLC, contacted us last week about website and logo design work. He has a small cleaning service business and was ready to get a site and logo created to be more professional. Our logo designer received his completed questionnaire within 24 hours of the order being placed. After about three days, our designer submitted three mock-up designs to Alan for review. Just a few slight changes to the color of one of the logos and he was happy with the result! Stay tuned for the completion of their website! Derek contacted us and needed a website overhaul. He is a professional / freelance photographer and moved to the Georgia area and wants to focus more on real estate photography. His existing website was mostly for celebrity photography and he didn’t have any ability to update or manage the website himself. We helped Derek setup the new website and loaded his pictures initially. Then, we turned him over to start adding and updating the site himself using the easy-to-use website editor platform that empowers our customers to manager their own site. He is up and running and is on his way to getting more photos added to the site! 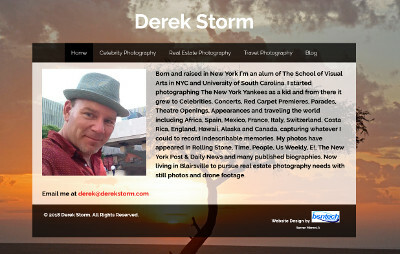 Derek’s website is at derekstorm.com. Thomas, the owner of Island Garden Services, LLC, sent us an inquiry and needed to get a simple website created for his garden and landscape business. Island Garden Services serves the Manatee and Sarasota counties on the west coast of Florida. Thomas provided us a couple of example websites and we provided an itemized estimate to him on what it would cost to do a site similar to those. He chose the simpler site with mobile compatibility and a contact form. Once we received the information, we had the website mostly completed within 24 hours. After having a phone call to discuss some minor changes last week, the website was completed and approved! His website is at islandgardenservices.com. Howard called us last week and asked to get a simple website created. 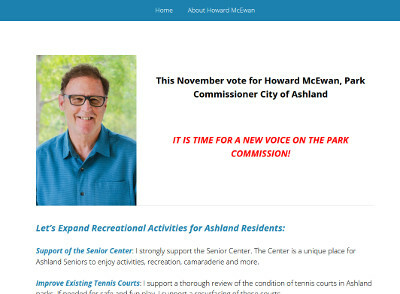 He is running for park commissioner in Ashland, OR and wanted to get a simple site for his campaign. Yesterday, he sent over the material that he wanted to have on the website. We completed the website in just a few hours and it was approved and set to be live! We appreciate the business from Howard. His website is at howardmcewan.com. Linda called us needing some immediate help with her business All Tubs Reglazing. She wanted to get a new website created for her business very quickly. She noted that the site needed to be done in a couple of days and wanted to know if we could meet that deadline. We responded – YES! Her needs were pretty simple and she gave us all of the material that she wanted on the website very quickly. We beat her expectations and had the website done the day after she made the initial payment. Once the site was done, she then asked us about our advertising services. We explained that we do Google Ads management and we require no contract or setup fees. We only charge a monthly commission based on the advertising amount that the customer wants to spend and we work on a month by month basis. With that in mind, she wanted to give us a try to see if the advertising management with us would work. We setup the ads and once they were turned on, she immediately started getting a couple of phone calls a day. Linda continued to increase her ad spending through the month of July and has continued to do the advertising through August so far. We appreciate Linda’s business and look forward to helping her with her website and advertising needs for the long term! The website for All Tubs Reglazing is at alltubsreglazing.com. Sara contacted us for some website design help. She already had an existing website but wanted to upgrade the website to make it more useful. During conversations, she elected to have us manage the website hosting, her email, and also the domain name. The first process was to re-design the website but keep the same information intact. She also sent over several pages regarding medical lawsuits that were added to the site. After the initial draft was done, we spoke about creating a drop-down menu and a few extra pages to highlight each of the main practice areas that she offered and examples of some of these practice areas. The website was completed very quickly and Sara was pleased with the level of service she received from us. Her website is at mcavoylawllc.com. Michael reached out to us by phone and was looking for help with their business, MR Estate Sale in SaddleBrook AZ. The primary need was help with email marketing. They knew of another website that BsnTech helped to create for another business that sent out newsletters and needed to have the same functionality. They tried a few of the other newsletter service providers but they were expensive and were a hassle for Michael to work with. Therefore, he requested some help from us to make it possible. During conversations, we spoke about the various features available on the website. Michael initially just wanted a simple site where they could allow for newsletter sign-ups, a listing of upcoming sales, and a place to post photos of the items in the upcoming sales. A few days into the design, Michael asked us about the possibility of making an online catalog for their clients that only had a few items (or only one) to sell and didn’t warrant a full estate sale. We explained what we could do and we setup the Online Marketplace for them. Michael is very pleased with the results obtained through us and the ease of using the newsletter system. 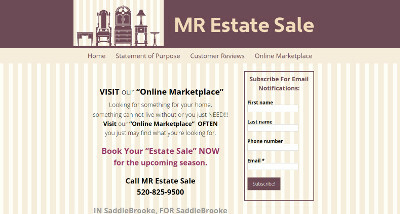 The MR Estate Sale website is at mrestatesale.com. Phillip, a customer that has had us create several websites for him over the years, was back and in need of another website for a relative. They needed to have an eCommerce website created for CTLG Factory Outlet. Like in recent services for Phillip, we assisted with getting the WordPress system setup, the theme installed, and some various configuration and formatting completed on the website. They then took over the final portions with adding in products and adding the content to their website. We appreciate the continued business from Phillip and are glad we have continued to exceed his expectations with our service offerings! Their website is at ctlgfo.com.